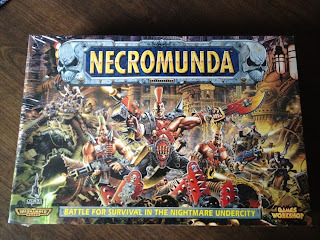 As I mentioned in this post I bought a 20-year-old sealed copy of Necromunda by Games Workshop off eBay. Since it isn't for sale anymore I thought I would show you what you would get 20 years ago with your purchase. Here's the list of what you get from the back of the box. Now for some reason, I couldn't find all the minis but you get 12 of each gang, Orlock, and Goliath. You also get a nice sourcebook and rulebook and painting guide. There is also a large and small book that features some of the other great Games Workshop games and minis you can buy. The Necromunda box set also comes with 7 assorted dice. Here is a picture of all the bulkheads and cardboard terrain you get. This is what it all looks like when built. These are all the counters the game came with. Here are the getting started quick rules and the sheets to write you gang information on. On the backside of the gang roster sheet is directions on how to build the terrain. These are the templates for different explosions and flamethrowers. I always liked the look of these compared to the plastic ones and they even name each one for you. The opposite side does not have the names on them in case you don't like the look. And finally the 2 sweet plastic rulers and 2 cardboard playsheets. I didn't need the rulebook because you can download the rules here. I also didn't really want the miniatures so much. Other than thinking that buying the sealed box was cool, I really wanted the terrain. It looks great and is easy to use plus I have lots of fond memories fighting over this stuff. The box came with 30 bulkheads and to buy them online today costs a bunch so I thought for a little more money I could get everything. This is a great box set for a great game. It comes with everything you need to play the game including enough minis for 2 gangs and enough terrain to actually play with. It was 50 dollars when it was new and was a great deal. Today box sets from Games Workshop cost way more and don't have as much in them. If you can find a complete set and like Necromunda, I would recommend picking it up. WoW alot of mixed emotions seeing this. A sealed copy! OMG i get green with envy since i never had the oppurtunity to nbox one of these great sets. And also i get moved seeing the content and knowing how awesome this stuff is. Wow just wow. One day i will get a complete copy, with or without shrink wrap! Thanks for the comments and I'm glad you liked it. I loved Necromunda but all my friends had the box set so I never bought my own. I went looking online for the pieces but to get everything included and in good shape I decided it would save me some hassle to just buy a sealed copy.